This male monarch was found along the Salt River in Phoenix Jan. 5, 2008 in the company of at least five others. 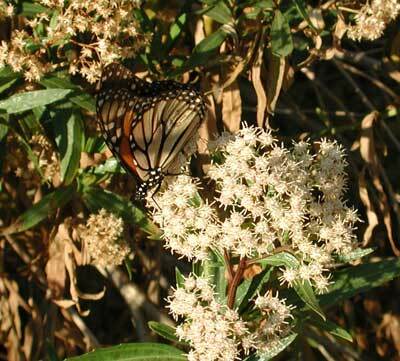 It is using a late-blooming Seep Baccharis as a nectar source. Monarchs are not to be found in the Sonoran Desert for most of the year. But during fall migration a few straggle through on there way south ... or west. In fact it has been some mystery given that there is a well known Monarch wintering site in central Mexico and yet another on the west coast of California near Monterrey. Monarchs in the Intermountain West are not so abundant as their eastern USA counterparts or even the population that inhabits Washington to California. It has not been clear where these Intermountain insects migrate - California or Mexico. Now it appears that there may be isolated pockets of Monarchs wintering outside the two well known areas. Very small aggregations of Monarchs have been spotted during the winter months in the Sonoran Desert along the Colorado and Salt Rivers. These habitats seem to offer higher humidity, trees with insulating canopies, and nectar sources nearby for occasional refueling. A few Monarchs are spotted in the Sonoran Desert during the spring. The Queen (Danaus gilipus) is a very common butterfly in the Sonoran Desert that resembles a slightly smaller, darker version of the Monarch. It does not migrate and can be found pretty much year round. Both species use various milkweeds as a larval food plant.